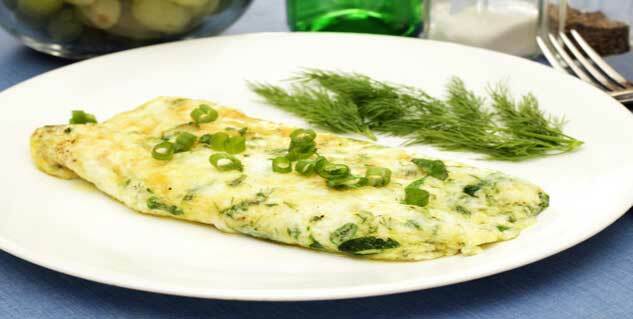 An omelette recipe is a perfect food for breakfast, lunch or dinner, or also for snacking. 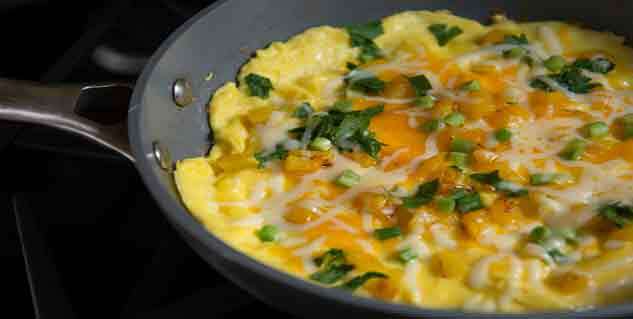 In cuisine, an omelette is a dish made from beaten eggs quickly cooked with butter or oil. 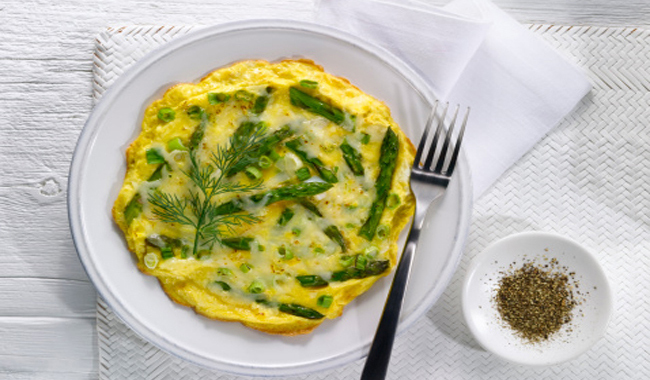 There is no one recipe but you can get creative with omelette preparation. Take a look at the different styles omelette can be made. You need 2 cubes of cheddar cheese, 1 teaspoon of melted butter, 1 egg (beaten), 2 teaspoon of milk, ½ onion (finely chopped). Heat the melted butter. Next, add the milk and the chopped onion to the already beaten egg and stir. Pour it in the pan. Toss the side when it appears to be firm. When the sides turn light brown, throw in the cheese cubes and cook for another 5 seconds. Serve hot with ketchup or mayonnaise dip! Masala omelette is the most famous omelette recipes in India. Beat the eggs till frothy. Add the ingredients (green chilies, capsicum, tomatoes, black pepper powder, turmeric powder and a few coriander leaves) except the oil and whisk well. Drizzle oil in a pan, allow it to heat up. Cook on low flame till the sides are cooked and the underside starts to appear brown. Slowly flip over and cook the other side. Slide the omelette onto a plate and serve with bread or buns. Cook the potatoes in a pot of boiling water for 7-8 minutes and steam the spinach for 5 minutes. Drain the potatoes and press the spinach to extract excess moisture and then chop. Heat the oil in a non-stick frying pan. Add the capsicum slices and fry over a moderate heat. Stir in the potatoes and spring onions and continue cooking for 2 minutes. Beat the eggs in a large bowl; season it with salt and pepper. Mix in the spinach. Take out half of the vegetables from the pan and add to the egg mixture just leaving the oil in the pan. Stir the egg and vegetables briefly to mix, then pour into the frying pan. Cover and cook, without stirring, for about 6 minutes or until the omelette is cooked but soft on top. Cook for a minute more and serve. Mix together eggs, onions, coriander leaves, green chilly, salt and black pepper. Whisk them gently. Heat oil at medium hot pan and pour egg mixture on it. Spread the mixture over the pan and cook till it is almost half done. When it is half done, take the bread pieces and put them on the omelette. Gently press the bread and cook till omelette is brown from both the sides. Once it appears brownish, it is ready to serve. Beat the eggs in a bowl. Add to it dried oregano, black pepper powder, green chillies, coriander leaves and salt. Mix these ingredients and keep it aside. Melt butter in a non-stick pan and add chopped garlic and sliced onion. Cook till the onion is little tender. Add the mixed ingredients. Cover the pan and leave to cook it for 2-3 minutes on a low heat.